We offer a solution that provides a more efficient working day, with fewer conflicts, reduced loss and improved liquidity. With our API, preform invoice follow-up and debt collection in SAP, while you getan overview of the entire invoice and payment flow - in real-time. Invoice handling happens automatically in your SAP system, and even the degree of automation can be adapted. Real-time data ensure efficient and accurate information, which allow you to deliver a truly excellent customer experience. Spend time leveraging your core business, and let the technology work for you. Want to see how the solution works? 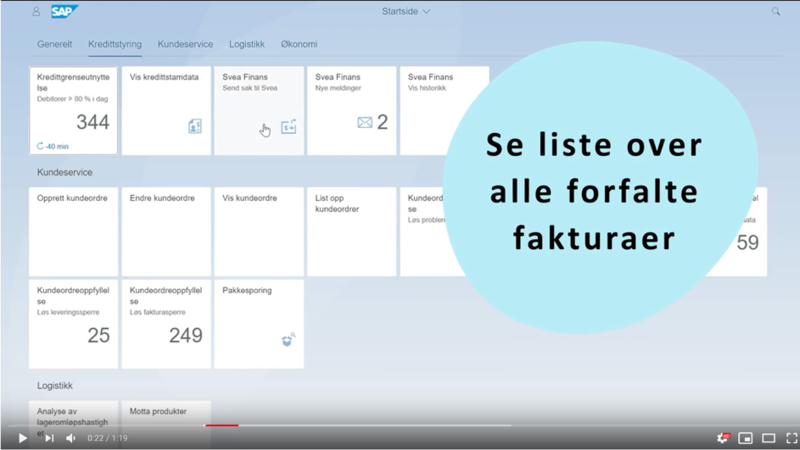 Visit our website to see video tutorials -that explain our SAP integration, and how easy it can be for you. Your customer service department can operate in real-time to process invoices or handle debt collection cases. Click here to get more information and watch the instructional videos. Svea Ekonomi is a privately-owned company established in 1981. Currently we have more than 2500 employees and subsidiaries in 20 countries. Through personal service, Svea Finans provide the market effective and customized solutions for financing, debt collection, handing of ledger and payment solutions. You can read more about our services at https://www.svea.com/no/.